Can you believe the calendar is showing February already? Hey January! Come back…or on second thought perhaps you had better stay where you are, cause you were cold and more cold. But let’s talk Valentine’s Day which will be here before we know it. I just love Valentine’s Day…but you knew I would, didn’t you? I try to find romance everywhere! I want to share with you a basket I made up several years ago….yes, I have been diving into my archives for inspiration. I love picnic baskets and am fortunate to have accumulated quite a few of them over the years. In my basket collection, I have a basket for carrying a bottle of wine, two (glass) wine glasses and the different implements for opening etc. 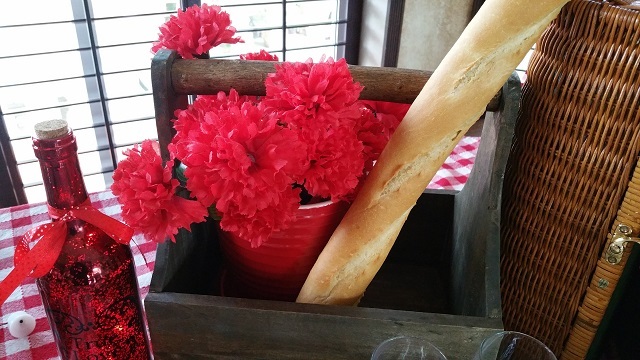 For this vignette, I used my red and white checkered tablecloth that I have had for over 40 years. 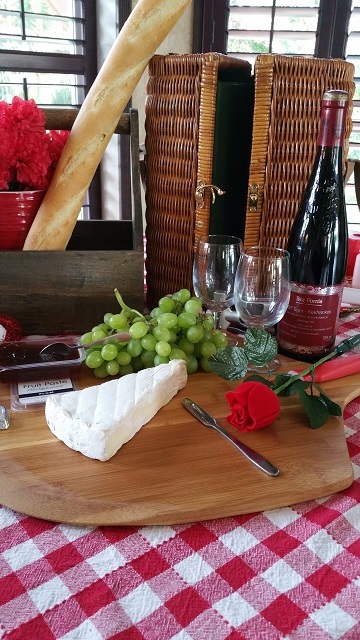 It has held up well and always looks festive or it can be more laid back for a picnic. I have always loved plaids, buffalo checks or whatever the current name….. and when I bought the red gingham, I also bought a blue and white gingham (which is what we called them at the time). 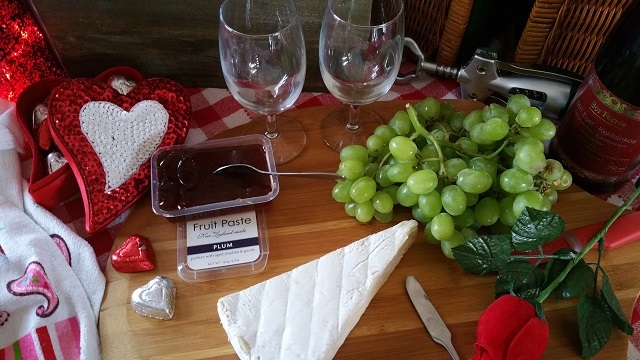 My pizza peel became a breadboard to hold my fruit paste, grapes and brie cheese. A loaf of Italian bread … you can’t have bread without cheese, so I decided to get one of my favorites, Brie Cheese. I just love the smoothness of it and when you spread a bit on the bread and top it off with a Plum fruit paste….Yummy! 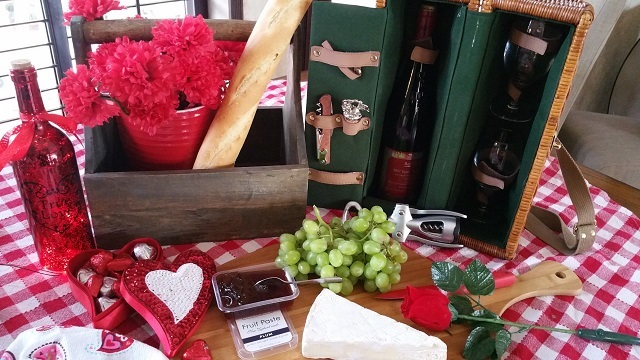 Add a few grapes of your choice, a few milk chocolate heart candies…a bottle of your favorite wine and Waaa-Laaa! Play some soft background music …and you have a very romantic Valentine “event”. Now how simple is that?…. ……of course if the weather is nice, the setting could be outside. However, from all the weather maps I have seen lately…indoors might be the best idea. A cozy fire in the fireplace could be the finishing touch! Are you my dear readers planning something special for Valentine’s Day? Or do you prefer an impromptu get-a-way to the park? Thanks for stopping by Ross…. :) When is your next dancing trip? Kari, hubby and will go out for a romantic dinner. I haven’t chosen the restaurant, but I’m thinking about it. Of course, I will get chocolates. Smile! Chocolates are soooooo good! The Captain usually gets me yellow roses (they are one of my favorites) and Dove dark chocolates. Such a fun vignette. Valentine’s day is when my hubby takes me out for a romantic evening. I feel so bad for those who are enduring the polar vortex. Give me chocolate and some champagne and I am good. Have a great weekend Kari. thanks Linda…I hope you are keeping warm in your part of the world. I am a”up” for chocolate and a cozy fire. thanks for stopping by. How perfect, an indoor picnic! Sometimes a meat and cheese plate is all we need to share for dinner at our house! so true. thanks for stopping by Chloe. I know it is weird, but we really don’t celebrate Valentine’s Day. We get each other a card, but don’t really do anything special. 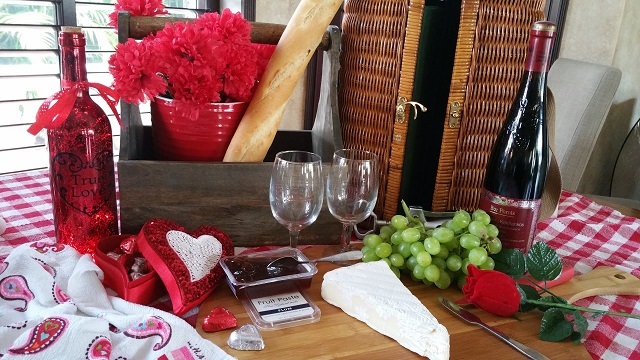 We try to do little things for each other on all the other days of the year and don’t feel a need to go over the top for one day…I know, weirdos…LOL I love your Valentine’s picnic basket…picnics are perfect when the weather cooperates…and indoor picnics in front of the fire are pretty darn special also! Have a great weekend! Love and hugs! Beautiful scape and post. It makes me feel like valentines day should be something celebrated several times to show the special person in your life what they mean. Thanks for sending the warm weather up. We made it through the negative fifty just fine but boy do I need to save some vacation money and get back home to Florida soon! Cute idea Kari! My son was born on Valentine’s Day, so we always have a birthday party! 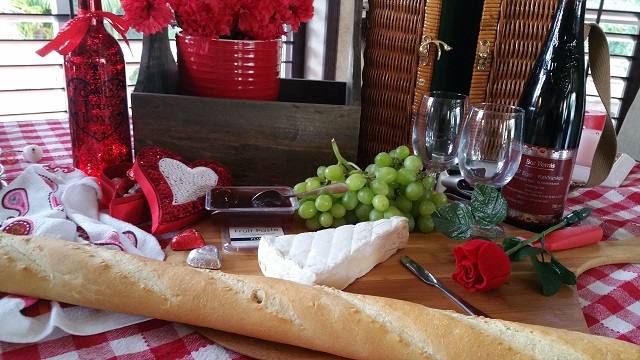 A lovely indoor romantic picnic for two! So simple and so delicious! Sigh!!! Yep! thanks for stopping by Nancy. This is terribly romantic, and sweet, Kari! I hope you and your captain have a wonderful Valentine’s!